There's a good reason that panel doors are among the most popular choices among American consumers seeking new or replacement doors for their homes. These attractive, raised-panel double doors allow for easy access for deliveries or moving furniture. The modern replications of period doors can include hollow interiors or fills with materials including staves, lock blocks, or solid flush-door insulation for energy efficiency and noise baffling. Modern hardware includes contemporary locks and deadbolts that provide resilient security and smooth operation. Wood panel doors require more maintenance than do vinyl models, including priming and re-painting following a year or more life in harsh weather conditions. Or you can choose six-panel doors in vinyl for easy wash and rinse maintenance. 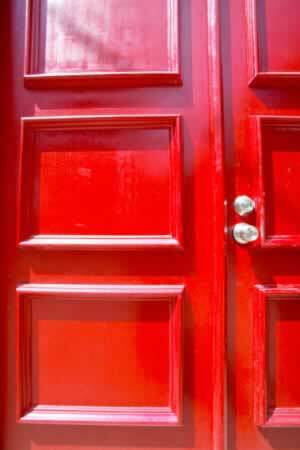 Red or vermillion finishes are excellent choices for period, Asian, Pacific, or contemporary designs. This panel door is an eye catcher!